Start/Finish : Jubilee Bridge, Brotherikeld, Eskdale. I knew this was going to be a great little trip. The omens were good as I drove over the Wrynose and Hardknott passes without even seeing another car. One of life's little pleasures. So I set off from near Jubilee Bridge heading for Green Crag. Perusing the map, the Birker Force waterfall looked like it might worth a detour and there did seem to be a vague path of sorts which climbed up along it. I soon found the waterfalls and the path which was indeed vague and required the use of hands and feet at some points. From the top of the falls it's an easy ramble along boggy ground towards the crags. There are many crags around this area, with Green Crag being the highest and so I decided to visit a few of them along the way. From Green Crag I headed for Harter Fell but took a minor detour over Dow Crag (no not the Coniston one - that would be a detour!). The ground is really wet in places around here. I had, until now, managed to keep my trail shoes dry ... but no longer. I finally succumbed to wet feet. The eagle eyed among you will note the deliberate mistake that I have pitched the tarp 'inside out'. This is because I wasn't using the 2 lifter points in the middle of the tarp (I forgot to bring 2 short bamboo canes for this) and so instead used them on the inside to attach my little tent light. It was a cold clear night. I spent a long time just watching the night sky which was pitch black and bursting with stars. I watched the space station pass over, saw many satellites and a few shooting stars. It was a mesmerising scene from the comfort of my sleeping bag. This is the great selling point for tarps but of course, being a certified wimp, had there been a hint of rain forecast or indeed any other such inclement weather then I would have brought the tent or the trailstar instead. Tonight though, it was perfect for a 'roofless' night under the stars. I forgot the bivvy bag (schoolboy error!) and so needed to wear my down jacket and insulated trousers to stay warm as the temperature got down to just below zero. Apart from a bit of wind (the weather that is, not the effects of my delicious Fuzion chicken tikka masala) is was a quiet night. I woke to frosty surroundings and a crispy tarp. I was up and away by 6am and onto Hard Knott summit to watch the sun rising over Cold Pike. All along the ridge towards Lingcove Beck are stunning views of upper Eskdale and the Scafells. It was a joy to watch the sun first touch Scafell summit and then move its way slowly down to illuminate the whole huge massif in an orange glow. My futile efforts with the camera really didn't do justice to this majestic scene. At the end of the Hard Knott ridge I followed the path down along the gorges and waterfalls of Lingcove Beck. It always amazes me how the old Lingcove packhorse bridge stays up. I have no idea when it was built and a quick google search was unrewarding but it looks like it has seen a good few decades and will likely see many more. From here its a lovely quiet walk following the course of the River Esk back to Jubilee bridge. Only here did I see another person since leaving the car the day before. Food : Fuizion Chicken Tikka Masala & Rice, Buttered Bread, Supernoodles,various sugary snacks. Clothes : Ron Hill wicking T-Shirt, Rab 100 wt fleece (250g), Montane lightspeed jacket (160g), TNF Meridian Cargo Shorts (190g), ME beany, Rab phantom grip gloves, sunglasses, Buff, Innov8 short socks. PHD wafer down jacket (about 200g). Montane Prism insulated pants (295g). 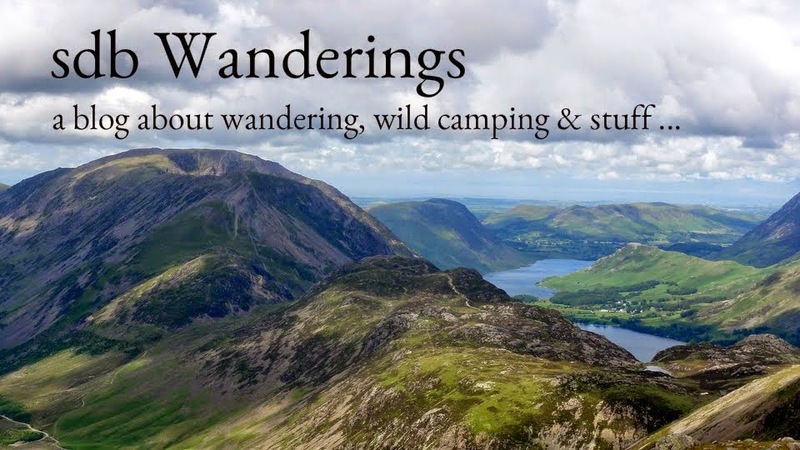 If you've made it this far then how about some summit panorama video's from Harter Fell and Hard Knott. Ok thats it. Shows over. Move on now. Here are a few pictures from a day hike up the Langdale Pikes over the Easter weekend. I took the boy with me. It was to be his 4th and 5th Wainwright fells and a good deal more height than his previous forays. We set off into thick cloud but with hope that the forecast would be right and we would emerge above the cloud base into clear blue skies. Thankfully, they were spot on. 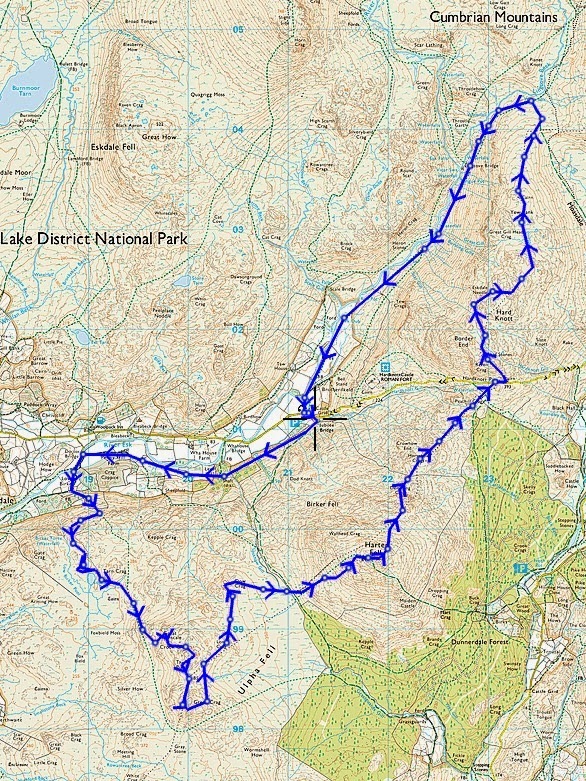 The route is the classic tourist path from New Dungeon Ghyll up to Stickle Tarn and then up onto Pavey Ark and Harrison Stickle.